There are many styles, types, and accessories to choose from when picking out the perfect window. Window ideas can help in new construction, replacement windows and simple remodels. What should you consider for each room of your house? In the living room it’s important to consider where furniture will be. For instance, if a table is in front of the window, consider a casement window that can be opened and closed with one hand from a crank at the bottom. It’s also important to know where the sun will be hitting the house in the morning and the evening when planning for window placement. Do you have to worry about the sun glaring on the T.V.? Or the excessive heat in the evening? Living room windows can dramatically change the look of your living room. They can add light to your room, enhance your wall colors or furniture, and even provide security for you and your family. Adding colors or tone to the room, showcasing a breathtaking view, or simply providing a more modern look are just a few living room window functions. Large combination windows are the most popular in living rooms. Mixing large picture windows with ventilating windows below or on the sides give you the best of both worlds. Milgard has a variety of colors, materials, sound control windows and styles to match what your window ideas for living room decorating are. People usually spend the most time in their kitchens. Therefore, it’s important to make this room functional and good looking. Enhance the focal point of the room, which is typically the sink, with large windows or combination windows in sets of two or three. Match the color of your traditional wood cabinets with Essence Series® wood interior windows. The wider the kitchen counters are, the harder it can be to reach your windows. A horizontal sliding window is a popular choice above a kitchen sink or counter, as it lets in a good amount of light and is easy to slide from any angle. Ventilation is a good thing to consider for a kitchen. Have you ever forgot something in the oven or burned something on the stove? Having windows open on each side of the room will give you cross ventilation. Use window styles to design your dream bedroom! Sound Control windows combined with stylish décor can make your bedroom the perfect sanctuary for quiet time and sleep. Bedroom window styles can be mixed and matched to your bedding, carpet or other furniture. New and replacement windows can create natural light, ambiance and a view to wake up to every morning. Local building codes usually have entry requirements for bedrooms, specifying the size and height of an opening in the event of a fire or other emergency. Often, casement or sliding horizontal windows can be a good choice for meeting these codes. No matter which window style fits your bedroom, Milgard can help inspire your design. For a bathroom window consider privacy/obscure glass options. These provide privacy without the need for window coverings, and they let in more natural light. Bathroom window styles can set the stage for your entire bathroom decor. Choose windows with lots of glass and even sightlines to match contemporary cabinets. 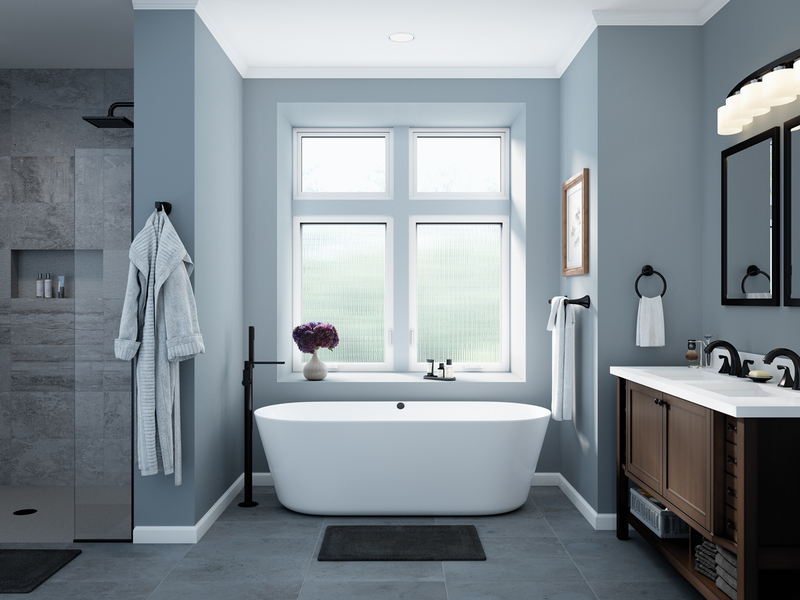 Vinyl Windows work well in bathrooms due to their durability while enduring daily moisture from showers. It is important to have at least one ventilating window in the bathroom to decrease chances of mold from of the humid environment. Awning windows are a great choice because they open upward to maintain privacy and provide shielding from rain when the window is open. Take a look at all of the room specific window designs available in our photo gallery under the filter button for inspiration and design assistance.